Since it was set up in 1997, the Adopt a Book scheme has raised money to preserve and conserve the wonderful collection of rare books in the Chapter Library. 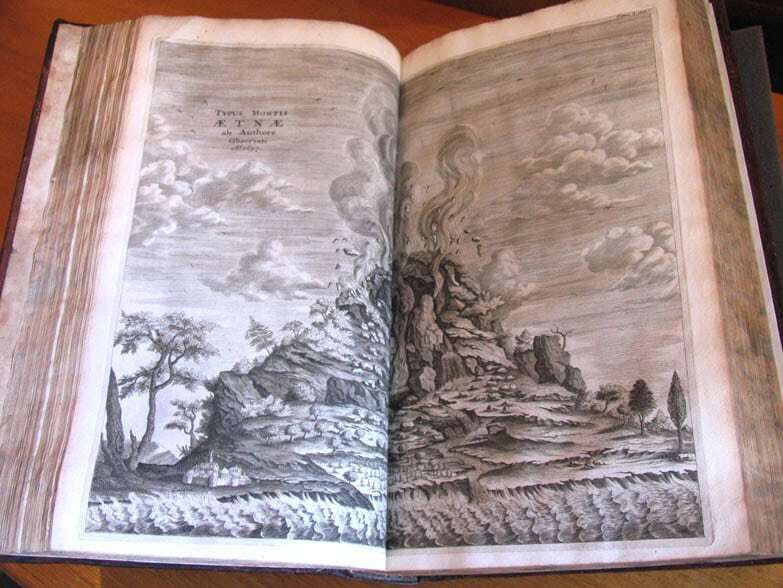 One volume recently conserved is Mundus Subterraneus by Athanasius Kircher, published in 1665. Kircher was a 17th century German Jesuit scholar who published in many fields, including oriental studies, geology and medicine. This volume publishes his geological and geographical investigations into natural phenomena such as volcanoes, earthquakes and fossils. His was a hands-on approach, on one occasion being lowered into the crater of Vesuvius shortly before it erupted. His thoughts were very advanced for the day, believing that the Earth’s interior was a giant, fiery inferno that heated water which had seeped from the ocean, causing the hot springs he witnessed. Volcanoes, he believed, were started when the fire came close to the Earth’s surface. Dedicated to Pope Alexander VII, the volume is lavishly illustrated with engravings showing all aspects of the underground world. This engraving shows Etna at the point of eruption, an event which the author witnessed first hand.